"This game fish will bite 'cha back! I serve this seared tuna garnished with a julienne of leek, carrot, snow peas and mung beans." In a large bowl, whisk together the five-spice powder, ginger, sake, rice vinegar, tamari, and sesame oil. Add the tuna steaks and turn to coat; allow to marinate for 30 minutes. Combine the crushed wasabi peas and brown sugar. Remove the tuna steaks from the marinade, and press into the pea mixture to coat. Pour the marinade into a small saucepan and bring to a simmer over medium-high heat. Reduce heat to medium, and simmer until the sauce has reduced and thickened, 5 to 10 minutes. While the sauce is cooking, sear the tuna in a small amount of oil in a skillet over medium-high heat to desired doneness. Pour sauce over tuna to serve. Great use of the wasabi peas. 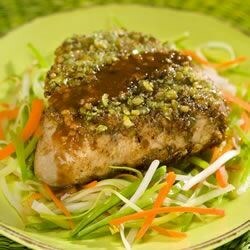 My husband loved the flavors in the marinade and the spice of the wasabi. Great way to prepare tuna steaks!! Congrats on being a finalist!